“Images and visuals are absolutely a critical part of marketing your product or service. 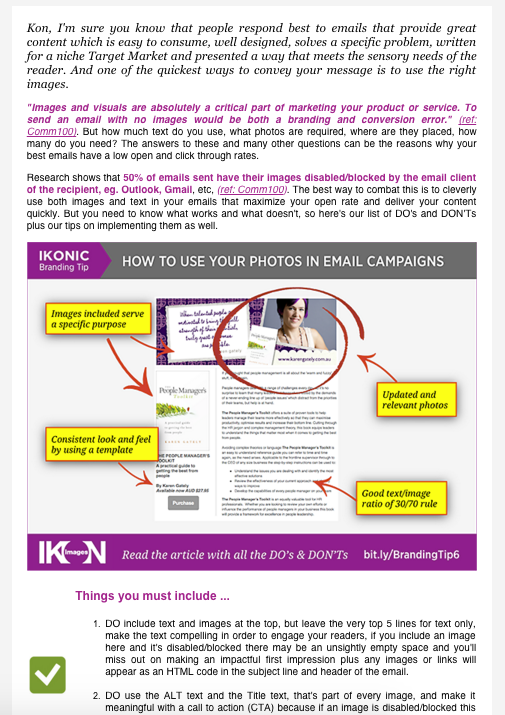 To send an email with no images would be both a branding and conversion error.” as stated in an article from Comm100. But how much text do you use, what photos are required, where are they placed, how many do you need? The answers to these and many other questions can be the reasons why your best emails have a low open and click through rates. Research shows that 50% of emails sent have their images disabled/blocked by the email client of the recipient, eg. Outlook, Gmail, etc, (ref: Comm100). The best way to combat this is to cleverly use both images and text in your emails that maximize your open rate and deliver your content quickly. But you need to know what works and what doesn’t, so here’s our list of DO’s and DONT’s plus our tips on implementing them as well. DO include text and images at the top, but leave the very top 5 lines for text only, make the text compelling in order to engage your readers, if you include an image here and it’s disabled/blocked there may be an unsightly empty space and you’ll miss out on making an impactful first impression plus any images or links will appear as an HTML code in the subject line and header of the email. DO use the ALT text and the Title text, that’s part of every image, and make it meaningful with a call to action (CTA) because if an image is disabled/blocked this is all the reader will see. DO add a caption under each contextually important image to further explain your point. DO make all your images ‘clickable’ so the reader can be directed to your website or social media, where ever you want the reader to go to next. And remember to include a text link as well so this covers the scenario of the images being displayed/blocked. This also allows you to measure how your readers respond to each image with the stats from your email marketing software. DO use images of smiling people because this creates an emotional and personal connection with your reader. Remember to connect with people’s hearts and minds and not their wallet! DO use a ratio of 30/70 for your images/text for the overall space in your email. This is a balanced view and ensures you have enough visual content for the reader and if the images are disabled/blocked then the text should be able to convey your message, at least in a written form, to the reader. DO use images when they add to your story/content/message because they help to convey your point faster, explain your concept easier or tell a story emotively. And remember never to use photos as a filler or for a splash of color, every element in your email must be present in order to support the Call To Action. DO limit the use of images in the top 2 inches of your email, a thin header image can be used if sized to no more than 600px wide x 75px high. DO place larger photos below the ‘fold’ to avoid big empty areas where the image goes in case the images are disabled/blocked. 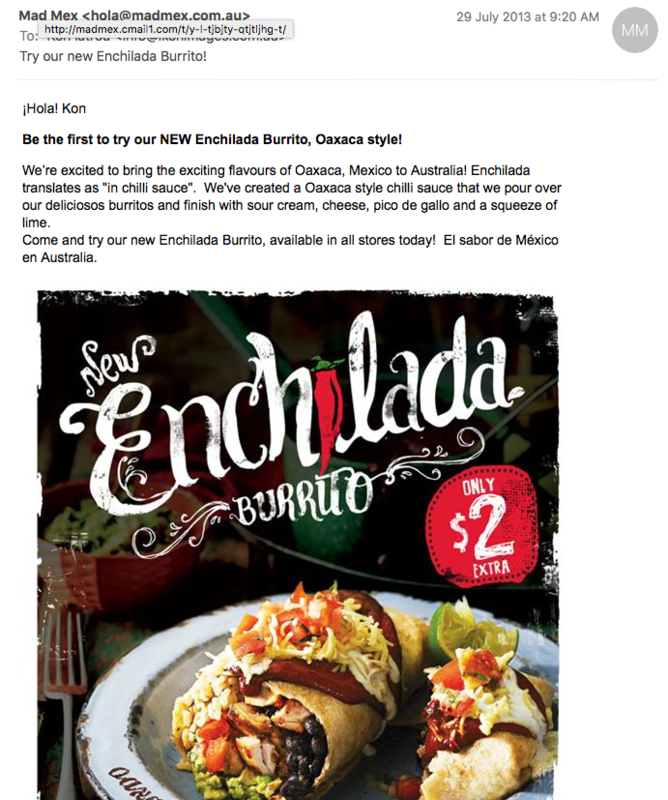 DON’T use image based emails, where the whole email is one image. 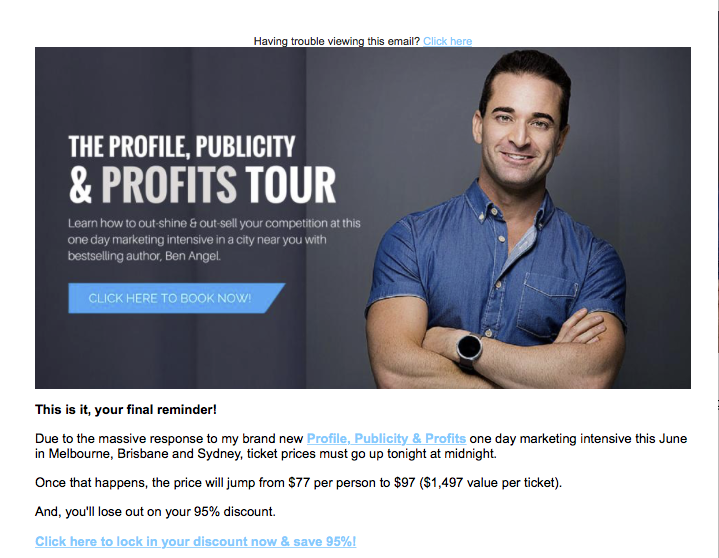 Remember, it’s an email, not a printed piece of marketing collateral like a flyer or brochure and some email clients will see this as a spam email and block you. DON’T overuse images in an email, remember the 30/70 rule for images/text. DON’T include links and important messages in the image/graphic in case they are disabled/blocked. If you want or need to include important messages and links in your images also include them in the text, so your messages aren’t lost. DON’T use outdated or inconsistent imagery, fresh is best in what you eat and that you present to your reader. Make sure your photos are relevant, show variety. The same old Headshot used on everything you present to your audience will get tired very quickly. Keep your photos on-brand and consistent with other imagery across your marketing. DON’T use a background image in your emails as this might not be displayed properly on all email clients and will look undesirable, hence damaging your brand plus distracting from your message. ADVANCED TIP: DON’T include any images in the top 5 lines. This area will be taken as the start of your email (the subject line and header) so include relevant content that will entice the reader to click on your email and open it. It’s preferable not to include any images or links (for viewing the email on a web browser), place them further down into your email. Links to images and web browsers can be presented as HTML code in the minimized email list views and look awful to the reader and says that this is a typical newsletter so keep the subject line and header area clear of images and links. 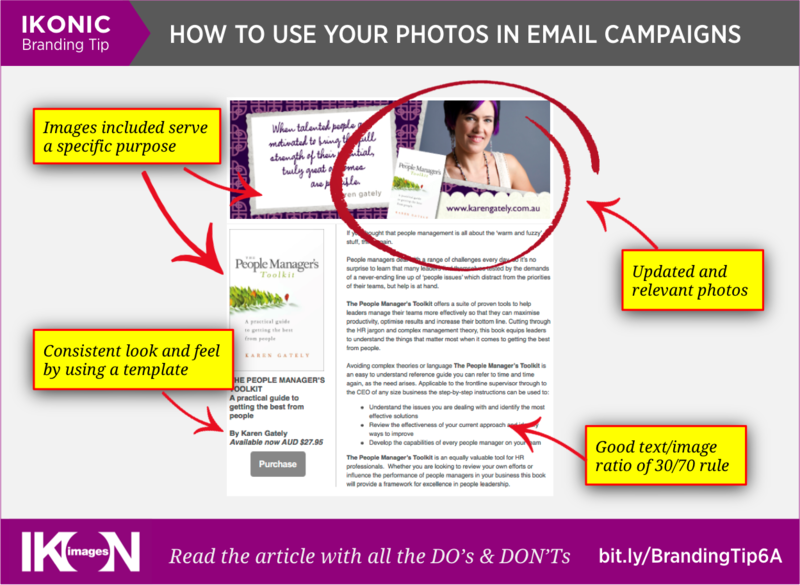 ADVANCED TIP: DON’T embed large images, the fewer images that are embedded in your email the better. Use a link to the image using an HTML line of code (see below). This will reduce the chances of your emails being blocked and reduce the overall file size of your email. Both are factors in getting your emails through to the recipient’s inbox. Header images (that are placed at the top of your email) should be no bigger than 600 pixels wide x 75 pixels high. Other images should be no more than 600 pixels wide. The file types that are recommended are: JPG or GIF. PNG files can be used but are typically 2 or 3 times larger than a JPG file which unnecessarily increases the file size of your email. Image resolution should be set to 72dpi not 300dpi. Personally, I’ve found that 150dpi is a good balance between high-quality sharp images vs their file size. ‘Clickable’ images need a url associated with them so that the reader can click on them and be directed to a website, landing page, etc. Enter the full url with the http://www in front of your website. Simply using ikonimages.com.au is not sufficient, instead use http://wwwikonimages.com.au so you include the full url. And then, test your email to ensure all the links are working properly, the last thing you want to happen when your reader opens your email is to have them click on a link which goes nowhere or to the wrong page. There are several key DO’s and DONT’s and specific ways to implement them in order to balance the use of text and images and to cater for the 50/50 split between emails that your readers see, with the images presented immediately and those that need to click to allow them to be seen. Here’s how our Email Campaigns now look when you take the above DOs and DON’Ts into consideration. Specifically, note that there are no images at the top of the page which leaves only pure content to be presented to the reader no matter how minimized their inbox view is or how expanded it is. 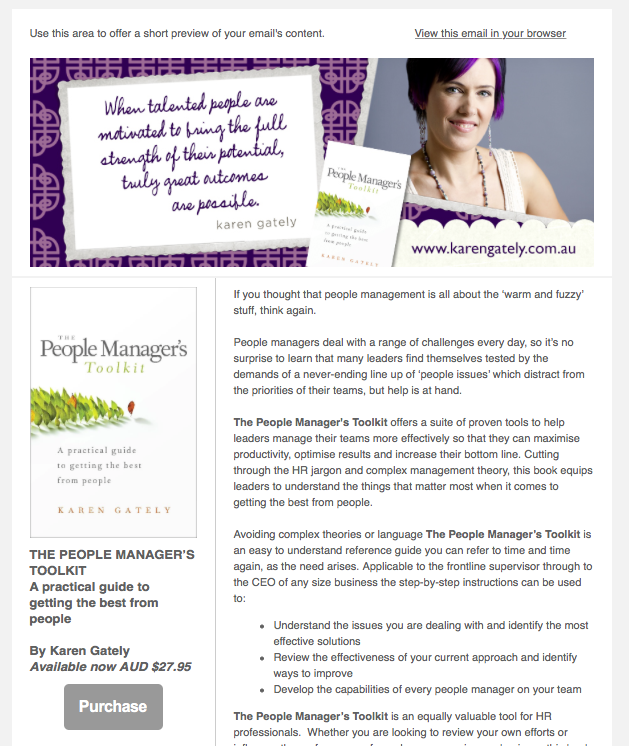 Also, the main image is hosted on this website and is also clickable and the link goes back to this very blog post. Now, this is what the recipient sees when they have the images in emails disabled/blocked. See how little information the recipient has to go on? The ATL and Title text doesn’t clearly communicate what the images are about. 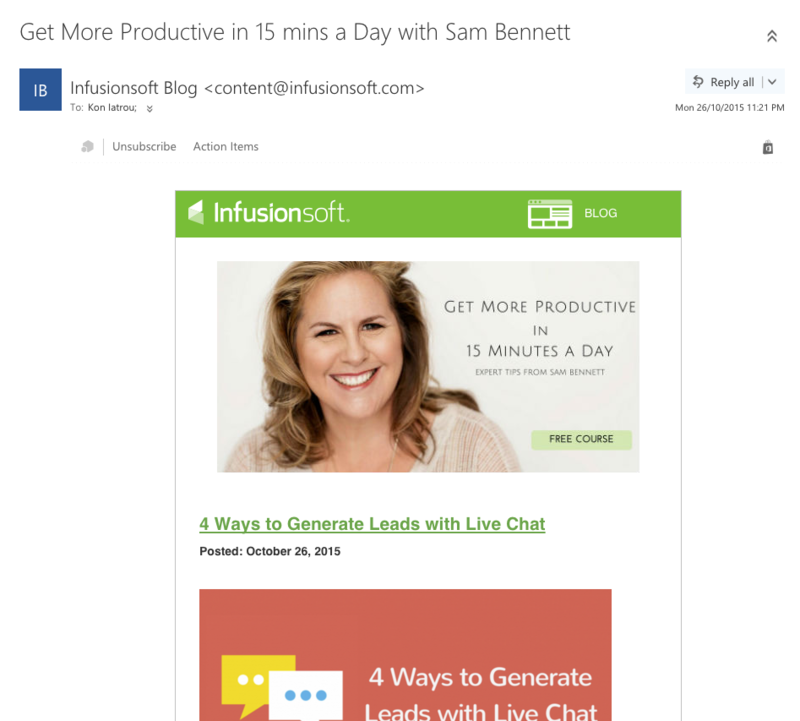 Using Infusionsoft – Display Images!, BLOG and SamBennett4_EC.jpg isn’t engaging and enticing to the reader. In fact, there is no good reason to continue reading this email, unless you were expecting to see it or you simply open everything from this sender. Also, note the two questions MSOutlook Outline (the email client used in this example) asks relating tho the images. The reader already clicked on your email to view it and now has to again be actively involved in allowing the images to be displayed. This is another blocker in getting your emails read and actioned. 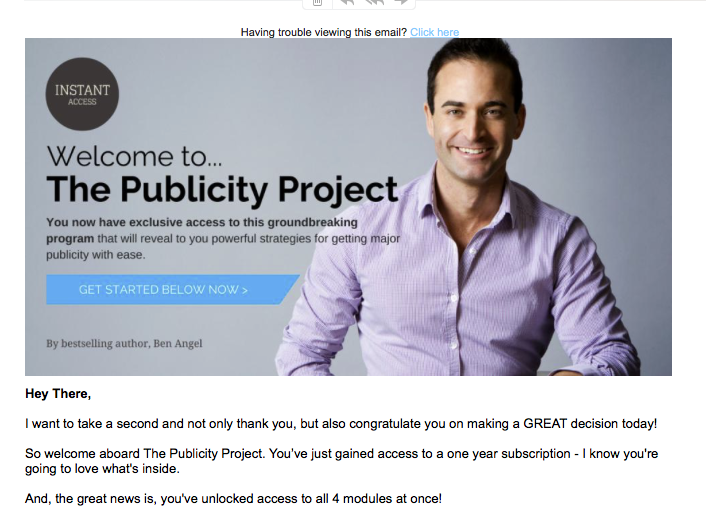 Here is what this email looks like when I click the link to see the images. 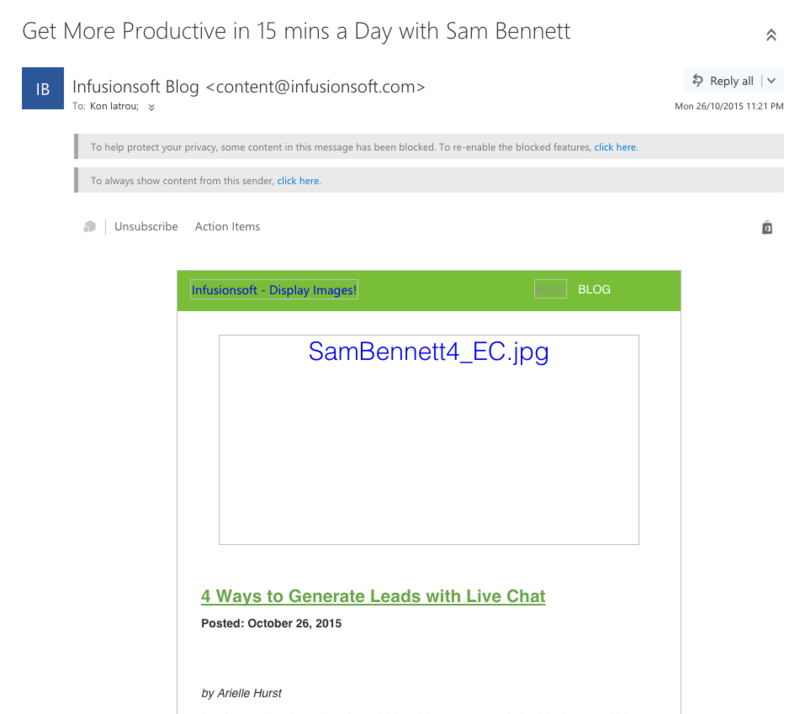 The purpose and title of the whole email is in the image and not included in the text: “Get More Productive In 15 Minutes A Day …” plus there’s a FREE COUSE! But all this is hidden from the recipient if the images aren’t displayed. 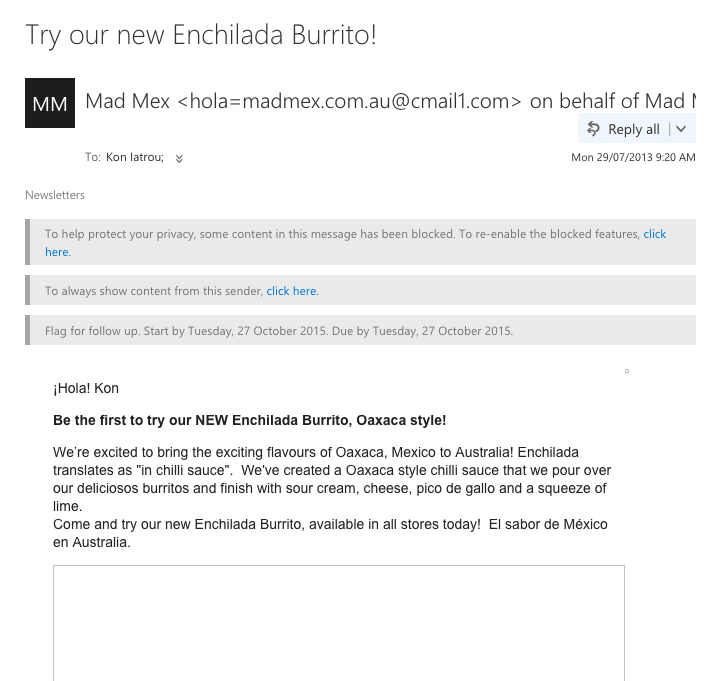 Here’s a great example from MadMex, see how they’ve placed the content which is all text and no images right at the top of the email and the large image placed further down. Now, this is what it looks like when the images are disabled/blocked from the minimal view displayed in MS Outlook Online and then when the email is opened. In both cases the reader is presented with the best content straight away, there’s no HTML code of links and images that are blocked, they get straight into it to maximize their chance of the enticing the reader to open their emails. 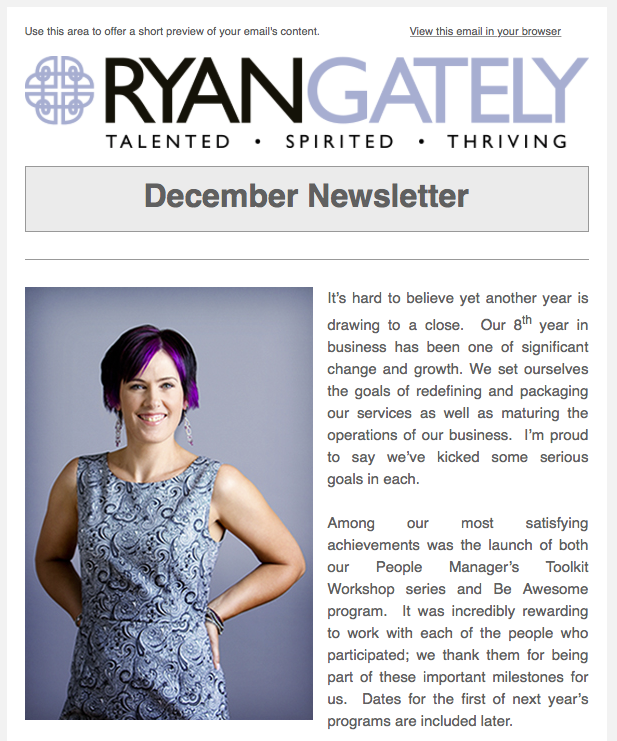 Here’s some examples from our clients on how they’ve used their photographs in their email campaigns. Great use of their Branding Portraits, if we do say so ourselves, which are engaging and show emotion that connects with the reader and they aren’t the same ones all the time as variety is important. All are used fresh and up to date photos. There’s no distracting background wallpaper type images. the emails are clean and easy to read. The images are ‘clickable’ and take the reader back to the specific landing page. The messages in the images are also presented in the text including text links so both options are covered. The 30/70 rule for images/text is well observed, so they look balanced (although no all of each email has been presented in this article) and so there isn’t an over use of images. 3.6.2 DeniseWakeman.com: Do Your Images Detract From Your Message? Do Your Images Detract From Your Message? 3.6.3. Slocumstudio.com: Should I put images in my email campaign? 3.6.6. Aweber: Don’t Use Another Image In Your Emails Without Reading This First!